The English word refuge refers to a place of shelter and protection from danger. What danger? We seek shelter from the passions that jerk us around, from feeling distressed and broken, from pain and suffering, from the fear of death. We seek shelter from the wheel of samsara, the cycle of death and rebirth. "The Buddha's teaching can be thought of as a kind of building with its own distinct foundation, stories, stairs, and roof. Like any other building the teaching also has a door, and in order to enter it, we have to enter through this door. The door of entrance to the teaching of the Buddha is the going for refuge to the Triple Gem — that is, to the Buddha as the fully enlightened teacher, to the Dhamma as the truth taught by him, and to the Sangha as the community of his noble disciples." In his book Taking the Path of Zen, Zen teacher Robert Aitken wrote that taking refuge in the Three Jewels more of a vow than a prayer. The original Pali words of the three "I take refuge" lines, translated literally, read "I will undertake to find my home in the Buddha," and then the Dharma and Sangha. "The implication is that by finding my home in the Buddha, Dharma, and Sangha I can free myself from blind conditioning and realize true nature," Aitken writes. When we say "the Buddha" often we are speaking of the historical Buddha, the man who lived 26 centuries ago and whose teachings form the basis of Buddhism. But the Buddha taught his disciples that he was not a god, but a man. How can we take refuge in him? Bikkhu Bodhi wrote that taking refuge in the Buddha is not merely taking refuge in his concrete particularity. "... When we go for refuge to the Buddha we resort to him as the supreme embodiment of purity, wisdom and compassion, the peerless teacher who can guide us to safety out of the perilous ocean of samsara." In Mahayana Buddhism, while "Buddha" may refer to the historical Buddha, called Shakyamuni Buddha, "Buddha" also refers to "Buddha-nature," the absolute, unconditioned nature of all things. While "Buddha" may be a person who has awakened to enlightenment, "Buddha" might also refer to enlightenment itself (bodhi). Robert Thurman said we take refuge in the Buddha as the embodiment of teacher. "We turn to the teaching of the reality of bliss, the teaching of the method of achieving happiness in whatever form it comes to us, whether it comes as Christianity, whether it comes as humanism, whether it comes as Hinduism, Sufism, or Buddhism. The form doesn't matter. The teacher is Buddha to us, one who can point the way to our own reality for us. He could be a scientist; she could be a religious teacher." "This refers, of course, to Shakyamuni, the Enlightened One, but it also has a far broader meaning. It includes mythological personages who preceded Shakyamuni and dozens of archetypal figures in the Buddhist pantheon. It includes all the great teachers of our lineage ... but also everyone who has realized his or her nature -- all the monks, nuns, and lay people in Buddhist history who have shaken the tree of life and death. In a deeper and yet more ordinary dimension, all of us are Buddha. We haven't realized it yet, but that does not deny the fact." 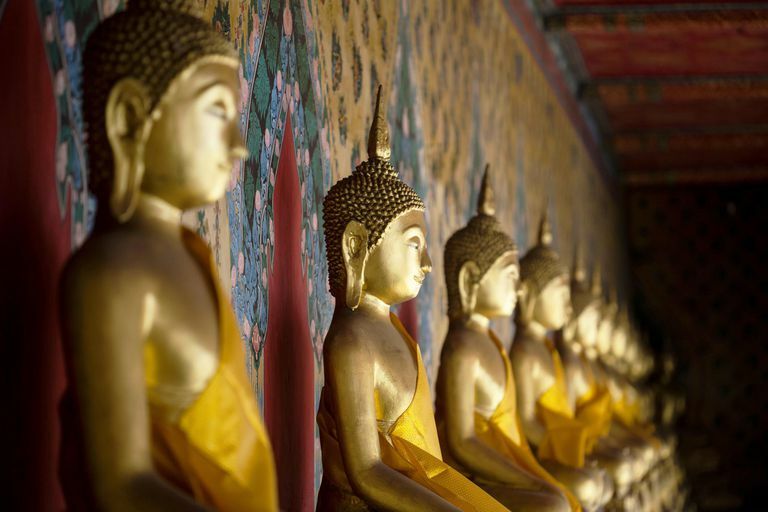 Like "Buddha," the word Dharma can point to several meanings. For example, it refers to the Buddha's teachings, and also to the law of karma and rebirth. It is also sometimes used to refer to ethical rules and to mental objects or thoughts. In Theravada Buddhism, dharma (or dhamma in Pali) is a term for the factors of existence or the transitory conditions that cause phenomena to come into being. In Mahayana, the word is sometimes used to mean "manifestation of reality" or "phenomenon." This sense can be found in the Heart Sutra, which refers to the voidness or emptiness (shunyata) of all dharmas. Bikkhu Bodhi said that there are two levels of dharma. One is the teaching of the Buddha, as expressed in the sutras and other articulated discourses. The other is the Buddhist path, and the goal, which is Nirvana. "Dharma is our own reality that we seek to understand fully, to open to fully. Dharma, therefore, also consists of those methods and the teaching of those methods that are the arts and sciences which enable us to open ourselves. The practices that we do, which will open us, which follow those teachings, which implement them in our lives, in our practice, and in our performance, which deploy those arts: they are also Dharma." Studying the Buddha's teachings--one definition of dharma--is important, but to take refuge in the Dharma is much more than just trust and acceptance of teachings. It's also trusting your practice of Buddhism, whether regular meditation and regular chanting. It's about trusting mindfulness, the present moment, right here, not putting faith in something far away. Sangha is another word with multiple meanings. It most often refers to the monastic orders and the institutional bodies of Buddhism. However, it is also often used in a way similar to how some western Christians use "church." A sangha can be a particular group of Buddhists, lay or monastic, who practice together. Or, it can mean all Buddhists everywhere. The importance of sangha cannot be overestimated. Trying to achieve enlightenment by yourself and only for yourself is like trying to walk uphill during a mudslide. Opening yourself to others, supporting and being supported, is critical to loosening the fetters of ego and selfishness. Especially in the West, people who come to Buddhism very often do so because they are hurt and confused. So they go to a dharma center and find other people who are hurt and confused. Oddly, this seems to anger some people. They want to be the only ones who hurt; everyone else is supposed to be cool and pain-free and supportive. "The sangha is the community of people who have the perfect right to cut through your trips and feed you with their wisdom, as well as the perfect right to demonstrate their own neurosis and be seen through by you. The companionship within the sangha is a kind of clean friendship-—without expectation, without demand, but at the same time, fulfilling." By taking refuge in the Sangha, we become the refuge. This is the path of the Buddhas.